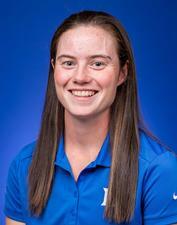 DURHAM, North Carolina: As Duke University’s Leona Maguire heads into the final month of her US collegiate career, the senior has been selected American College Conference Golfer of the Month for April. It marks the ninth time she has earned league golfer of the month accolade over her career, which is an ACC record. A native of Cavan, Ireland, Maguire, pictured, won her third ACC individual title by defeating team-mate Jaravee Boonchant at the third play-off hole of last month’s ACC Golf Championship at Greensboro’s Grandover Resort, after finishing 54 holes with a six-under-par total of 210. Maguire also led Duke to its second straight and 21st overall ACC team title. Earlier in April, Maguire finished tied for third at the Liz Murphey Collegiate Classic with rounds of 70, 69 and 71 for a 210, helping the Blue Devils tied for a second-place team finish. She broke the Duke career record for most career rounds of even or under par with a total of 82. The win at the ACC Championship was the 10th overall of her Blue Devil career, which ranks third all-time at Duke. For the month, Maguire totalled five of her six rounds at even or under par and held a 70.0 stroke average. She currently holds the British women's open amateur title she won in June last year. Duke, the No. 1 seed in the Madison Regional, will next compete May 7-9 in Madison, Wisc., for a chance to advance to the NCAA Championship in Stillwater, Okla.